Japan claims this is the 12th incursion by Chinese vessels in the East China Sea to date this year. On Monday, Japan’s coast guard said that four China Coast Guard patrol ships entered the territorial waters around the disputed Senkaku/Diaoyu Islands in the East China Sea. The uninhabited islands are administered by Japan, but claimed by China. According to the Japanese Coast Guard, the latest incursion took place in the morning before 10:00 a.m., with the Chinese vessels passing within 12 nautical miles of Uotsuri island — one of the islets in the Senkaku group. According to NHK, the Chinese vessels had been navigating in the contiguous zone — defined as 12 nautical miles from the edge of the territorial sea — since at least April 30. The Japanese Foreign Ministry filed a complaint with the Chinese government over the incident, according to NHK. After a period of relative calm in the East China Sea, Chinese naval and coast guard transits into the contiguous zone and territorial waters of the disputed islands in the East China Sea resumed last summer. 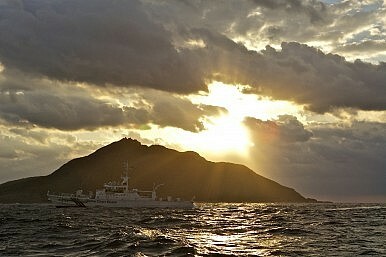 Last summer, a Chinese Navy frigate entered the territorial sea of the Senkaku Islands for the first time since 2004. Later in the year, seven China Coast Guard vessels accompanied approximately 230 Chinese fishing trawlers in disputed waters around the islands. Last year, the Japanese government claimed more than 30 separate intrusions by Chinese vessels into disputed waters in the East China Sea. This year, Japan has recorded 12 incursions to date. Tensions between the two east Asian neighbors spiked over the East China Sea after Tokyo decided to nationalize the Senkaku Islands in 2012, to prevent their sale to Shintaro Ishihara, the nationalistic former governor of Tokyo. In 2013, China declared an air defense identification zone over much of the East China Sea, drawing a sharp reaction from Japan, the United States, and other regional states who defied the unilateral Chinese move. In 2014, U.S. President Barack Obama, for the first time, explicitly clarified that the disputed islands fell under the purview of the U.S.-Japan mutual defense treaty, signaling that the United States would come to Tokyo’s aid should any aggressor attempt an invasion of the islands. That assurance was repeated by U.S. President Donald J. Trump’s secretary of defense, Jim Mattis, during his first trip to Japan earlier this year. Why did the People's Liberation Army-Navy send a submarine to the disputed islands?